Character: Highly-hopped Barley Wine uses 10 different hops, at 100 IBUs. Here is the second beer that was shared from Ryan’s collection at Het Mowry Huis van Vele Bieren or Ryan’s House. Check out his website if you haven’t already… RYAN’S REVIEWS. As a craft beer lover, I am happy to have friend’s like Ryan, who travels cause of his job, so he gets to bring back some really good stuff that we normally will not get here in San Antonio. Here we have Reel Ales, no not Real Ale from Blanco, TX, but Reel as in fishing reel. 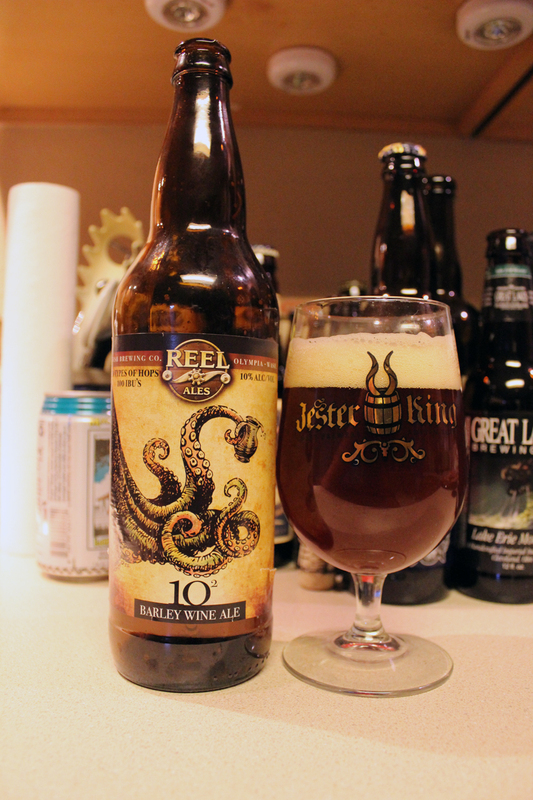 The actual beer name is 10² Highly-Hopped Barley Wine Ale, as Reel Ales is the name of the series by Fish Brewing Company from Olympia, WA. This is my first time ever even hearing about this brewery, but apparently they have been pushing out craft ales since 1993. They have the Fish Tale Brew Pub in two locations, Olympia and Everett there in Washington. They also brew a few different brands there at Fish Brewing; Fish Tale Organic Ales, Leavenworth Biers, and Spire Mountain Draft Ciders. Reel ales is their newest brand brewed up by Fish Brewing Co. These are unique and different style of beers. In this line there is their Swordfish Double Cascadian Dark Ale, Starfish Imperial Red Ale, Monkfish Belgian-Style Tripel Ale, and of course their 10² Highly-Hopped Barley Wine Ale. Using a Jester King Goblet style glass, this beer poured a murky looking brown color with hints of ruby when the light hits. There was a nice two finger wide frothy off white head, which retained well, and left a good sticky lacing down the glass. Hops were definitely present in the aroma. I picked up some piney, earthy, even some citrus notes in the nose. Very hop forward in the aroma. There was a nice malt-like smell as well on the back end, which made a nice mash up in my nose. The taste was pretty bitter for sure. Hop driven flavors up front. There is a good amount of sweet caramel malt, toffee like flavors as the backbone of flavors here. For me, the name of this beer was hit spot on in all areas, especially the taste. Bitter, hoppy, malty barley wine. Great mixture going on here. There was a lingering boozy aftertaste. The body was of medium thickness. Creamy mouthfeel overall, but the first initial sip was bright, and crisp due to the hops. This beer was nicely carbonated. Overall, I will see why Fish Brewing Company really promotes this beer, and says it’s their flag ship beer for the line of Reel Ales. According to their website, 10² Barley wine has received a 99 rating on RateBeer.com. I can see how. Very impressed by this beer. If you happen to be able to get your hands on this beer, do so without hesitation. I know people age barley wines but due to the over-hopped style of this one, I am not sure exactly how this one would hold up years later. Maybe get more than one bottle, so you could enjoy it fresh, and one later, so you can compare notes. Metal Connection: I went with one of old favorite Death Metal bands here, Sinister, from The Netherlands. I chose the song “Leviathan” from their 1993 album, Diabolical Summoning due to the leviathan being a creature of the deep sea. The label of this beer has monstrous octopus tentacles painted on it, so my mind automatically went with this song. Sinister has had a long and awesome career releasing ten full length albums, despite a number of line-up changes throughout the years. Enjoy some classic Death Metal here, and good luck for the hunt for 10² Barley Wine.